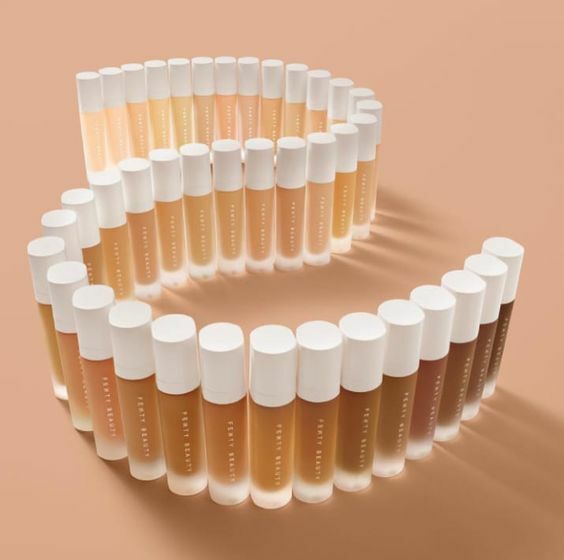 The inclusive line of cosmetics changing the game one foundation shade at a time is Fenty Beauty. The recently launched makeup line has everyone talking and already made a huge impact on the makeup industry. Owner of Fenty Beauty, Rihanna, is taking a huge step forward in the industry and is becoming one of the very first to focus on an issue that has been overlooked by many cosmetic companies in the past. Rihanna has made it clear that she is very passionate about creating an inclusive makeup brand and wants there to be something for every single one of her customers. It’s no secret that inclusivity has always been a huge issue in the fashion and beauty industries. In the beauty industry, especially, it’s hard for every individual to find makeup that works for them and their specific skin tone. Fenty Beauty is paving the way for all makeup brands, becoming the first to have such a broad range of products. The first launch giving customers an impressive 40 different shades of foundation to choose from. In addition, a variety of choices for concealer and highlighters that work for all kinds of skin tones were included. There was even a universal lip gloss that was made to work for everyone. The line’s inclusivity is benefitting women of color greatly. According to The Cut, the Sephora exclusive sold out of the darker shades of the foundation almost immediately. On the other end of the spectrum, we have Krystal Robertson, an albino woman, who has previously had trouble finding makeup that worked for her. She recently shared her love for the brand on social media saying, “@fentybeauty I’m freaking out!!! #110 #PerfectMatch #WhatSkin!!! !” Robertson shared in September as she captioned a selfie on Instagram. “…rethinking all the times I ended up orange.. it’s a new world great job @badgalriri #AlbinoMatch”. She went on to share just how happy she was to finally have a makeup shade that flawlessly matches her skin tone. According to Vibe, the launch of the line has been so successful that it’s keeping other makeup brands on their toes and many are beginning to feel threatened by the success of Fenty Beauty. Several other cosmetic brands are already taking note of how well the public is reacting to Fenty Beauty and are trying to draw the public’s attention to their also “inclusive” range of shades. Diversity within makeup lines is an issue that has always been an issue, but now that it is being brought to everyone’s attention, more brands will hopefully follow suit.